The Allman Brothers Band was formed in 1969 by Duane and Gregg Allman, along with Berry Oakley, Dickey Betts, Butch Trucks, and “Jaimoe.” Their musical combination of the elements of rock, blues, jazz, and country was hugely successful and continues to stand the test of time. Tragically, both Duane Allman and Berry Oakley were killed in separate motorcycle accidents in 1971 and 1972 respectively, but the band endured with the remaining original members and additional members for forty-five years. Inducted into the Rock and Roll Hall of Fame in 1995, The Allman Brothers Band received gold and platinum sales awards for their recordings. Filled with more than two hundred captioned images, this new book chronicles Weston’s collection and other items of The Allman Brothers Band memorabilia from 1969–1976. Weston and Perkins discuss in detail the various categories and aspects of band collectibles from that period. The book not only highlights individual collectibles, but also explains where to find them and how to preserve them. Included are band instruments and equipment, t-shirts, apparel and merchandise, autographs, bookkeeping documents, passes, posters, tickets, programs, promotional items, vintage photographs, and more. Galadrielle Allman, daughter of the late Duane Allman, offers an introduction that is both intimate and informative. Fans of classic rock music and The Allman Brothers Band alike will find this book irresistible and prepublication interest from fans has been phenomenal. The cover of The Allman Brothers Band At Fillmore East is the Mount Rushmore of rock album covers. I own signed (by photographer Jim Marshall) prints of both the front cover and the back cover of the greatest live record ever made. Sometimes I just stand and stare at them—just imagining the gear those cases hauled, even if they were empty at the time of the photo shoot. I examine the bricks in the wall, the added picture of Twiggs. You think I can name the band members on the front? Of course, who couldn’t? But how about the back, the road crew? Here goes—Red Dog, Kim Payne, Joe Dan Petty, Mike Callahan, and Willie Perkins. Not something I looked up on the internet, I’ve just known since I was 15. Thank goodness for this book so I can quit thinking I’m the only one who’s crazy. 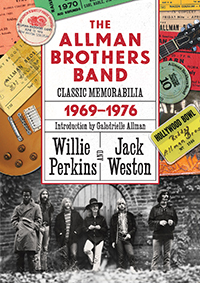 Willie Perkins and Jack Weston paint a vivid picture of the history of the mighty Allman Brothers Band through the group’s memorabilia and gear. These inanimate objects come to life through photographs and in-depth tales and tell a story about a band of brothers and their dedicated crew and fans. This book provides a mesmerizing, in-depth look deep into the lore and history of America’s greatest band. This gathering of signed checks and hotel receipts, t-shirts and promo stickers, ticket stubs, and road worn gear is a tribute to a golden moment in time when my father strutted proudly and played his heart out every night with his band of brothers. This is the stuff from which history is made. The Allman Brothers Band is my all-time favorite group, and I have collected all of their albums and singles over the years, along with memorabilia that includes stage passes, posters, magazines, books, and many other items. My favorite is a mint copy of At Fillmore East with the pink Capricorn label, personally signed by Gregg Allman, and nicely framed to show the cover and one of the actual records. When I first heard that Willie and Jack were doing this book, I felt that excitement of nostalgia rush through me like I hadn't experienced in quite some time. Seeing the book, I can truly say that it is everything I had hoped for and more. Great photos, many in color, and descriptions make this a Big House Museum in book form. It's a much welcome addition to my own ABB collection. The profound impact The Allman Brothers Band has had on their legions of fans can be distinctly seen by the countless number of avid collectors of memorabilia over the 45 years of the band’s history. The music business changed as did the world’s technology and now the band has influenced another generation of listener and collector. This book showcases the passion of collectors and those directly connected to one of Rock-n-Roll’s greatest bands. Thank you to Jack and Willie for this wonderful collection—your dedication to The Allman Brothers Band continues their legacy.